ATLANTA, June 2, 2017 /PRNewswire/ -- This week marks the start of the 2017 Atlantic Hurricane Season and Georgia Power is hitting the road with its Mobile Command Center (MCC) to highlight the importance of preparedness and electrical safety before, during and after a storm. Georgia Power monitors weather 24 hours a day, 365 days a year and remains ready to respond and restore service to its 2.5 million customers throughout the state whenever severe weather strikes. The company manages storm response activities from its Storm Center in Atlanta and often deploys the MCC to affected areas to serve as the company's communication and tactical hub. 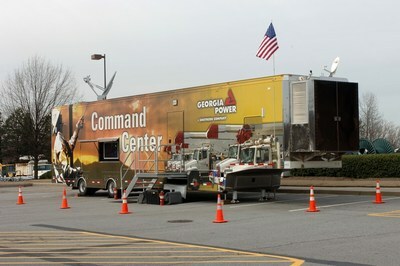 On Friday, June 2, the Georgia Power MCC will depart Atlanta and make its way to Savannah for the annual Hurricane Expo. The road tour will make stops at landmarks along the way, traveling down the evacuation route through Macon on I-16 to its final stop in Savannah. As the MCC treks along hurricane evacuation routes, the public is invited to follow the journey on social media using #GeorgiaPowerPreps. "Ensuring reliability for customers is our constant commitment and we're prepared both day and night, for summer thunderstorms or once in a century storms like Hurricane Matthew," said Hamilton Hardin, emergency operations director for Georgia Power. "For customers, the time to prepare for severe weather is when the forecast is clear and we are excited about this opportunity to take this important message on the road." Emergency Plan and Kit – Visit the Georgia Power hurricane resource page for information on how to build a family emergency plan and emergency supply kit.